Apologies for the delay, but as you’ll read on I’m sure you’ll forgive me. This was something I’d been planning for for ages. I have been going to Salute annually for about ten years before moving to Austria. Then I had a two year gap. I was hesitant but it was my Wife who encouraged me to go as I hadn’t been back to England since the move. Salute, for those of you who don’t know, is one of the largest wargaming shows in Europe. Here you get a chance to see a whole load of traders and get to see their merchandise in the flesh. It is also a chance to look at a huge range of games that had been lovingly prepared over the last year. There is also the painting contest. This is drawing in some of the best painters from around Europe, so I didn’t stand much of a chance, but nothing ventured etc. I wanted to enter the Salute figure contest. Every year in your goodie bag is a free figure which can be entered into next year’s contest. Now as I hadn’t been for a couple of years I didn’t have the figure. A quick request on the Oldhammer Facebook group soon dealt with this problem. Many thanks to Mr. David Wood, more of which later. Once the list of traders was announced on the Salute website I spent a fair amount of time visiting every single traders website and working out a wish-list. Then came the job of prioritising what I wanted to buy. 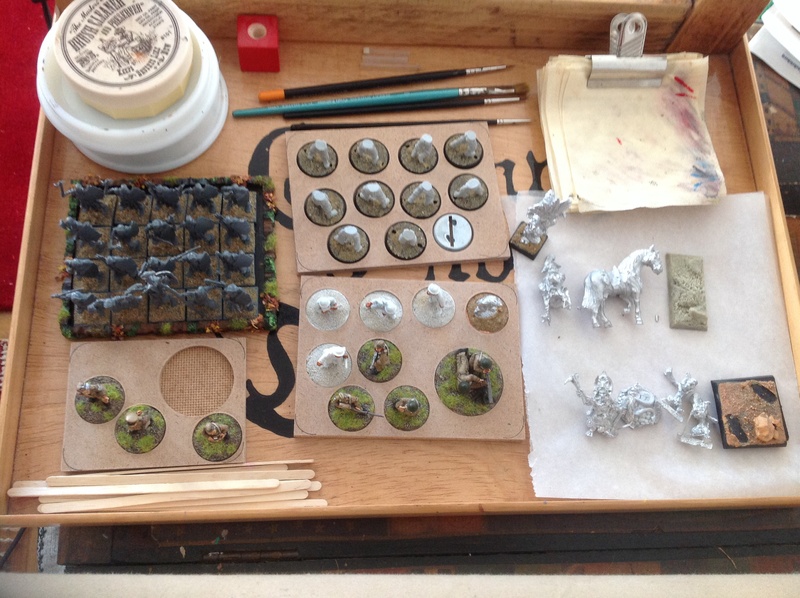 In theory I had an unlimited budget but I was also aware that my lead mountain was vast (about 15 years worth of painting) so I tried to narrow the list down to what I actually needed and within a reasonable budget. 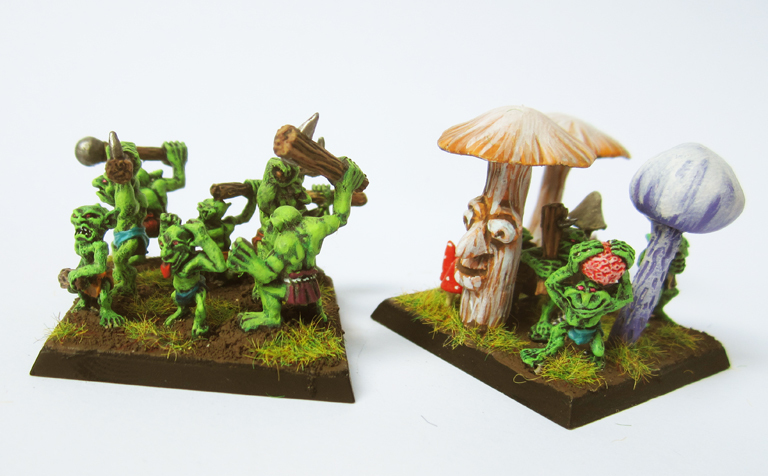 I allowed a bit of wiggle-room as there was Kevin Adams, The Goblin Master, and no real prices or stock on the website. Once I had drawn up my shopping list I printed out the Salute site map. Armed with my shopping list and site map I worked out a hit list in my notebook going up and down the traders in the most time efficient manner. As I said this was my first visit for a couple of years and my first from abroad, so no home base as I was previously used to. The cheapest ticket option was to stay for five days. So a bit of Facebook posting got me some sofas to surf on. The first two nights was to be spent at my old gaming buddy Seb’s house. Two days before flying I was struck with severe abdominal pains which lasted almost twenty four hours. I was worried that I would have to go to hospital and miss Salute. A further worry was that if it returned whilst in England I would have to visit and English hospital. After Austrian hospitals any trip to an English hospital would be like a trip to the third world. Thankfully the pains vanished the day before flying, much to my relief. I managed to squeeze everything into my little holdall, just grams under my ten kilo allowance. For the return journey I had booked a suitcase which was to be donated by a friend. I had also bought a lot of bits and pieces on Fleabay and had them sent to my Daughter’s place. Also in preparation I had some business cards printed up along with a promotional t-shirt. These I had sent to Seb’s. The first delivery was left in the rain by the courier company so the printing company promptly sent another batch. Seb opened the first package and the contents were fine. I now had a couple of hundred cards to distribute in the queue to enter Salute. The flight was uneventful but getting a connecting bus to Stratford was chaotic. The bus was grimy and I was reluctant to sit on the seats. Such a contrast to Austria. It chucked it down when I arrived in Stratford, everything was grey and miserable and the pavements seemed clogged with fag butts. A mad dash to get some shopping done, Tea and hitting the Poundshops (I do miss them) for epoxy glue, superglue and plug adapters. Then back to Seb’s. We had a pleasant evening and I played Lords of War (http://lords-of-war.com/) for the first time. This was a Kickstarter I had backed with the bonus that the cards were illustrated by Steve Cox (http://stevecox.prosite.com/) who was two years above me when I went to college. Saturday, Salute day! It was up early to get a good place in the queue. I had a minor problem with my ticket, which was swiftly resolved when I showed the email correspondence I’d had with one of the event organisers. This gave me a chance to hand out my business cards. At the time of writing there has been zero interest in my tawdry offerings. I met Mr. David Wood, my Oldhammer Facebook friend who I’d never met in real life before and we spent the hour before the doors opened chatting away. Then at ten o’clock the doors opened and in we went. The day was a blur, not helped by my abdominal pains returning, and my carefully planned route didn’t happen. Here are some of the highlights, that I can remember. 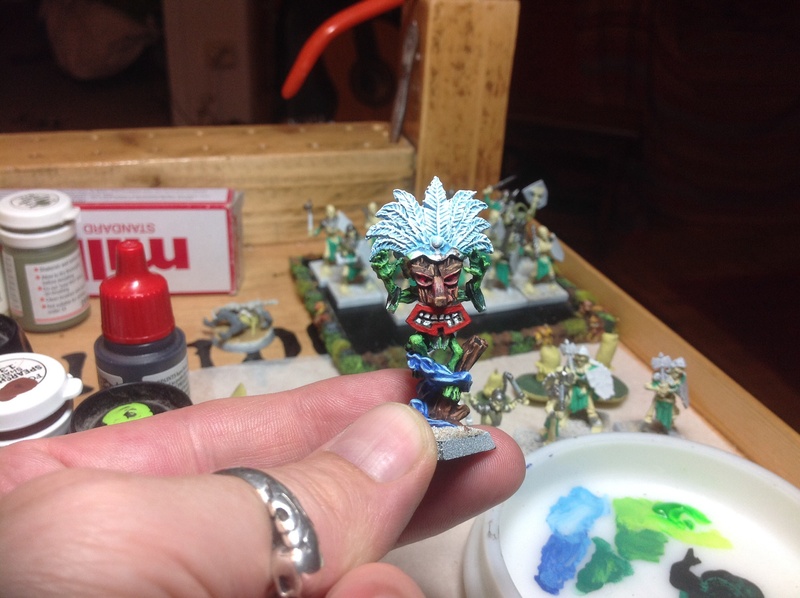 Meeting Annie from Bad Squiddo Games (https://thedicebaglady.net/) and showing her one of her figures I had painted. The Oldhammer meet-up at the Foundry stand. This was sparsely attended but it was nice to meet some of the people I know from Facebook and blogs. I dropped off my “Souvenir” to Mantic, see previous posting. A rather cool Mad Max game, apologies as I can’t remember who did it. Picking up my copy of Open Combat, another Kickstarter I’d backed. A bonus was that I met Gav Thorpe there, he writes for GeeDubs Black Library and I regretted I didn’t bring along one of his books that I had brought for the trip. I met Alan and Michael Perry, Paul Thompson and Chris Cound all old White Company compatriots. 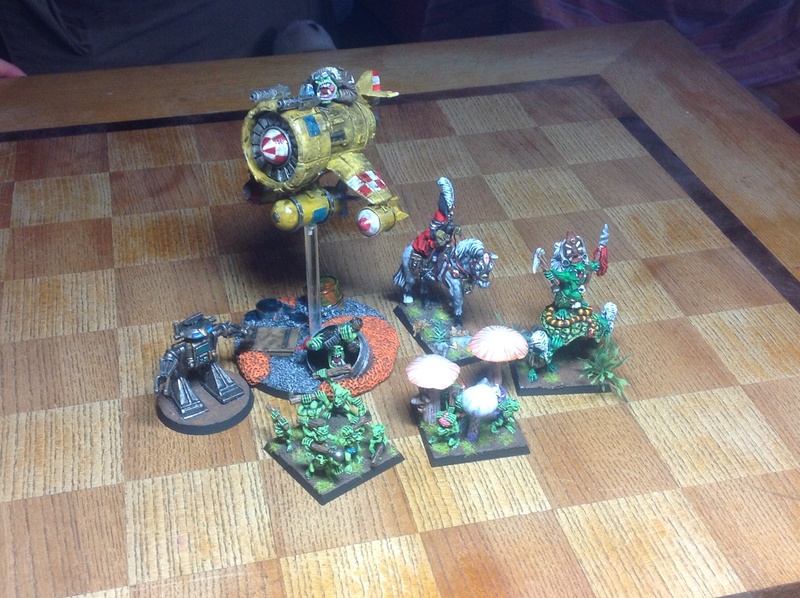 At Heresy (http://www.heresyminiatures.com/shop/) I was humbled to meet Andy Foster and showed him that the Dragon is on this years painting list. Apparently most are still in their boxes. Mine will not be, July to be precise, when my airbrush corner is set up in the workshop. I entered a Heavier Metal speed painting contest and won that round, and a Salute goody bag, and got to keep the figure which was cool because it was on my shopping list. In the prize goody bag was another Salute freebie figure which I gave to Mr. David Wood who then promptly gave me some of his own figures. He made me promise that I would paint them. So I had better do that. I left the show in a haze of discomfort and can’t really remember much else about the show. Luckily I’d scribbled some notes down otherwise it would have been quite a slim posting. The next day I went to hospital. They would have sent me away with a packet of paracetamol had I not mentioned that I would not be able to see a GP for a few days as I was visiting and I was concerned that my urine was a rich teak colour. I got admitted immediately and was diagnosed with acute pancreatitis. I ended up staying four days in hospital and missed my flight. Don’t talk to me about the food, I refused to touch it. Not even the head of catering could provide a full ingredients listing. Anyway I’m back in Austria. I had my gallbladder removed as it was full of large gallstones. You can talk to me about the food here, beef-steak with fresh asparagus, stuffed chicken breast with pesto mini dumplings. April saw me not terribly motivated and to try and get out of the rut I decided to paint some single figures that were started or primed but not finished. Just for fun. First off was this figure: General Sir Eddard Sharp. He was a promo model for the Arcworlde Kickstarter Sculpted by Alex Huntley, basically Mister Arcworlde. 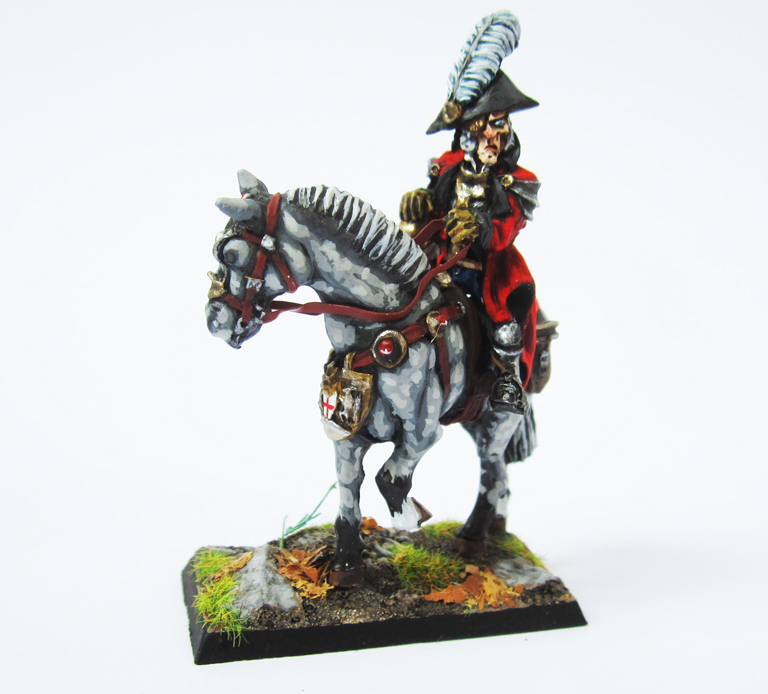 Alex’s sculpting is not polished, he is very talented and his style is very characterful and great to paint. 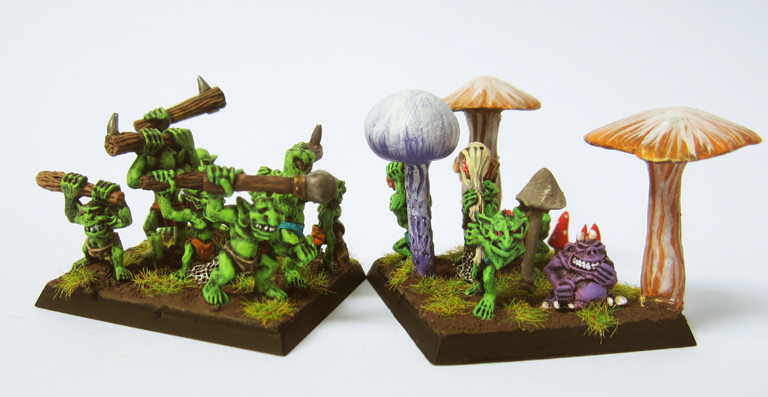 Very like the Battleforge Halflings that I painted a while ago. He deserves our support, he’s only twenty and if he is putting stuff out there like this now imagine what amazing stuff he’s going to be producing in ten years time when he’s hit his stride. Second off was this fellow. 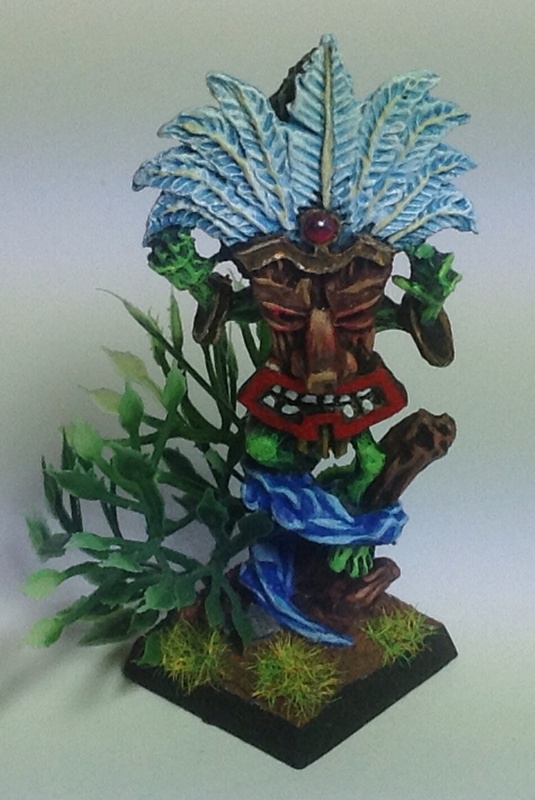 Again sculpted by Alex, this is The Big Chief of the Jungle Gremlins of Chaq-Itza. Then it was my beloved Snotlings. 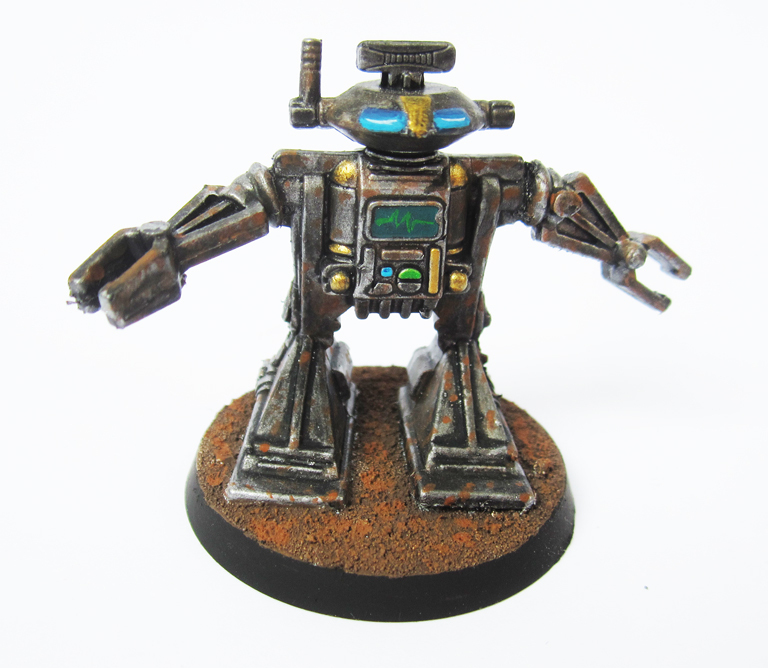 This guy was a cheap plastic robot that I picked up from a charity shop. He’ll be joining a few others in my “Not” Imperial Guard Army. 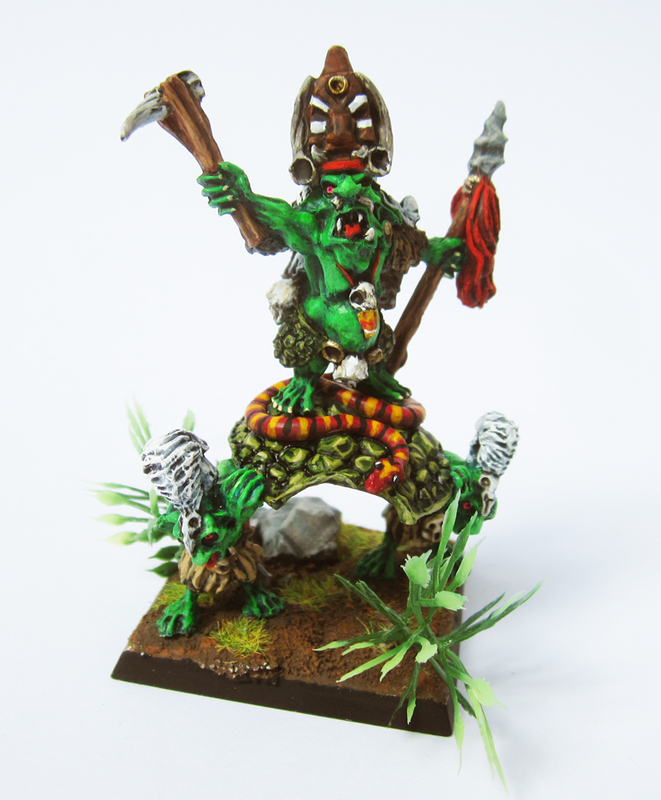 Finishing off with this from Puppets War. 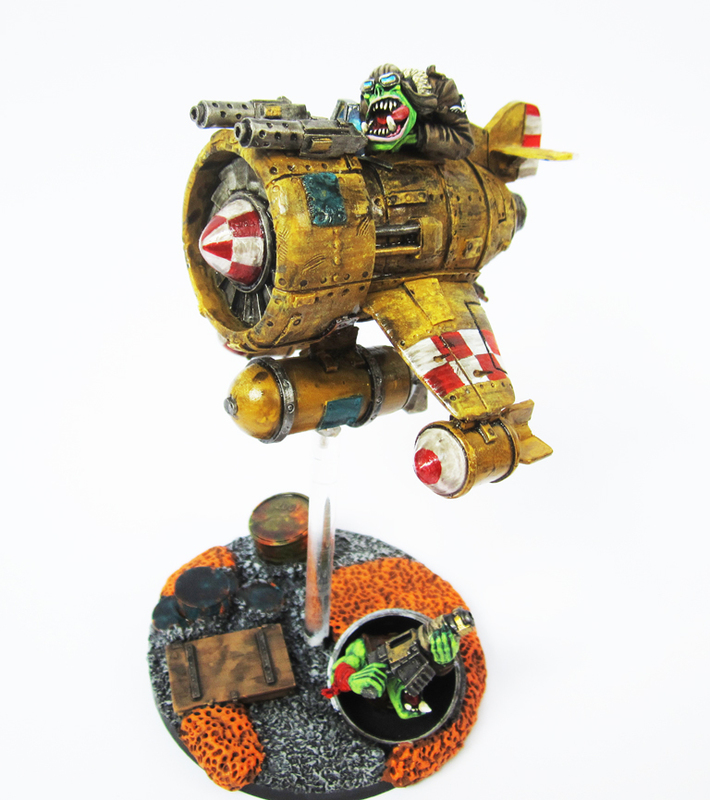 A proxy Deth Kopter in my 40K Ork Army. They all need a coat of matt varnish just to seal them. This is what I achieved this month, some new and some finished off. They now need a coat of matt varnish then I’ll post better pictures and some descriptions of what they are. I haven’t painted for the sheer pleasure of it for a couple of months now, so today I thought I’d change that. I haven’t set myself any targets or goals this month. It’s all about relaxing. I have been putting in a fair few late nights making artwork for my laser cutting and have been putting painting anything far away. This is one figure from the Arcworlde Kickstarter I received a few months ago but didn’t start, well apart from prepping and priming. This month I have mainly been despondent. A mixture of birthday blues and the weather. After an amazing autumn the winter has come, it’s all grey and bleak. 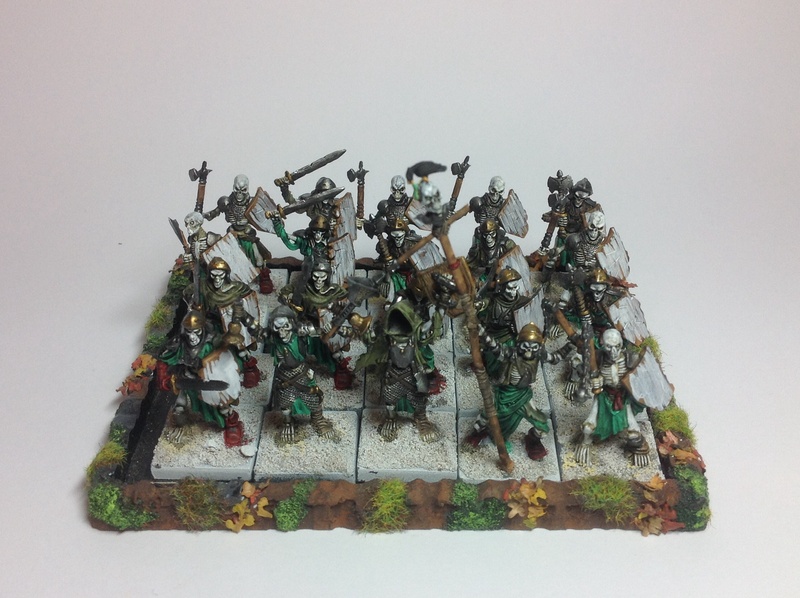 This month’s workbench was all about finishing the unit of Fir Bolg for my Albion Army. I really started to hate batch painting and not really liking the colour scheme I used. 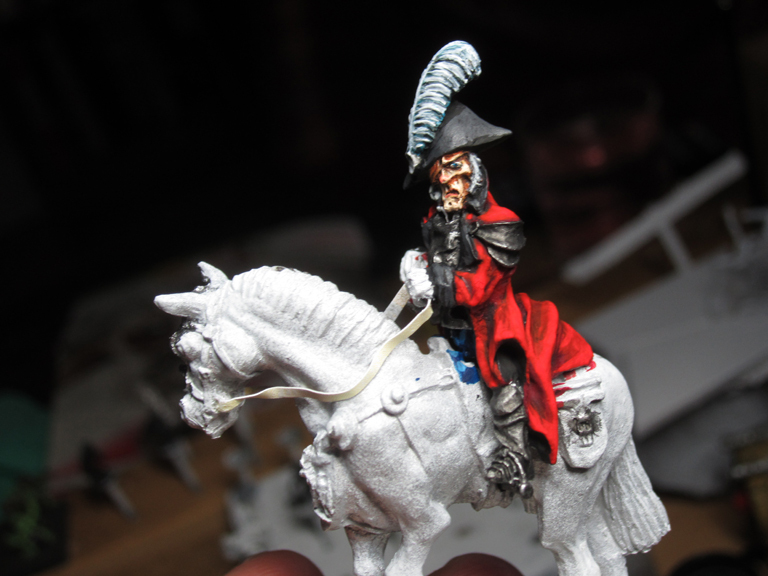 So I broke off to paint one of Alex Huntley’s Arcworlde miniature. 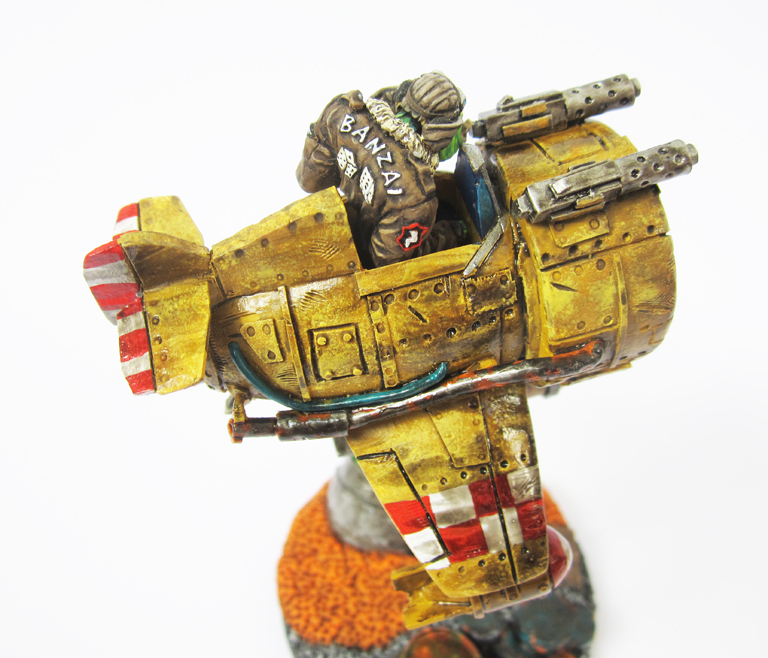 Do check out his company, Warploque Miniatures. He is alarmingly young and alarmingly talented. His figures have a certain style, not to everyone’s taste I will say, which I like. I backed his Kickstarter because I believe that in about ten years if we keep supporting him he will be an awesome sculptor. This perked me up a bit. I do enjoy painting single figures. 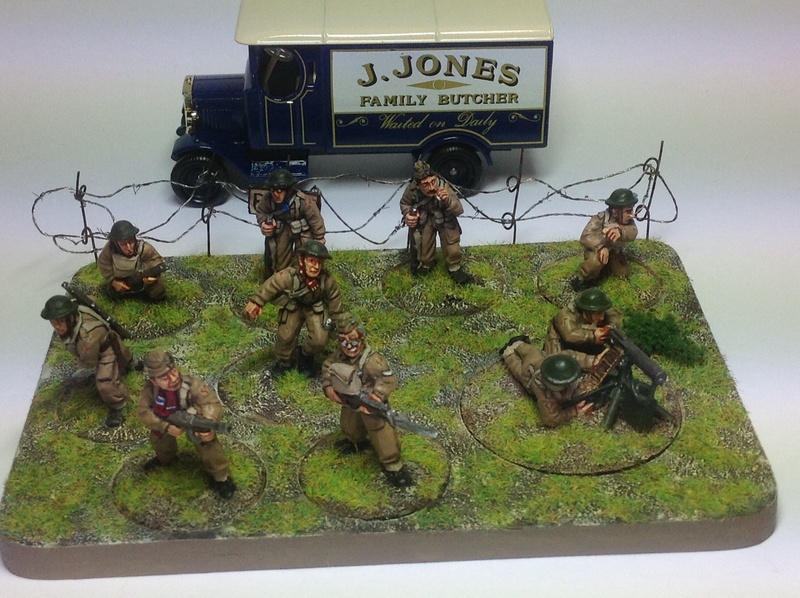 Then I got on with the Bolt Action Dad’s Army squad. These were Foundry figures. Much nicer than the ones that Warlord Games released. It’s obvious when you know that the Foundry ones were sculpted by the Perrys. 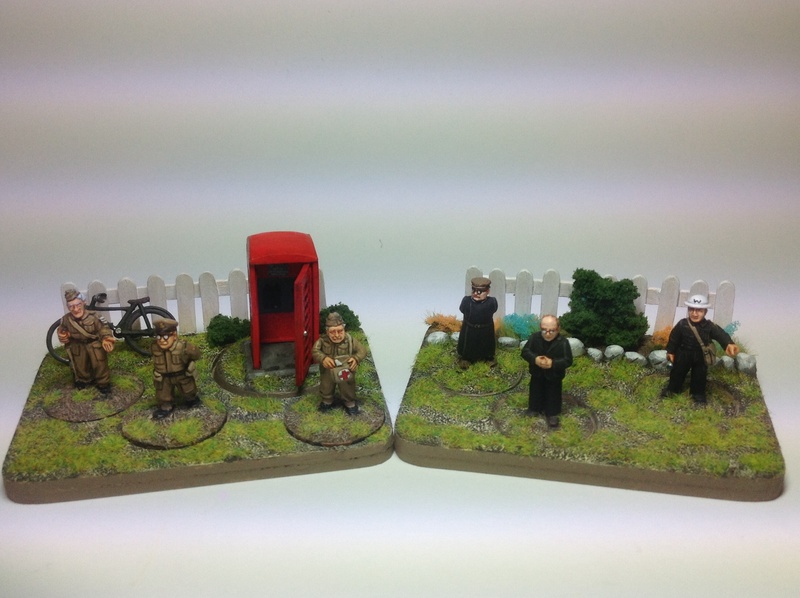 Some of the figures I had already painted in England. I just wanted to get the squad finished and the command. Had a little play around with the movement trays to make them a bit more interesting. Then it was back to the slog of the Fir Bolg. I painted them in block colour and it was only a couple of days ago that I finished that. I dug out two new brushes to finally replace my old ones. The fine detail one was down to four bristles and the blocker wouldn’t hold it’s shape. My new fine brush is a Creative Models Synthetic 2/0. So far impressed. And the blocker is a Daler-Rowney Dalon D77 1. Not so sure yet. New brushes suddenly made the painting easier. I perked up a bit but the figures were just not doing it for me. Then two days ago I finished the blocking. Time for a wash, using Army Painters Strong Tone Wash. POP! Much more interesting. Shadows, grubbiness more depth. I’ve highlighted the bones. It just remains to finish the bases, paint the eyes a glowing pink (or green, haven’t quite decided) and paint the Cross of Saynte George in Tamiya Clear Red; once varnished. So still a couple more days work before starting December’s work. And having to go to Vienna for a Nicholaus Party. I am so fed up with batch painting at the moment so decided to splash a little colour about to relieve the monotony.